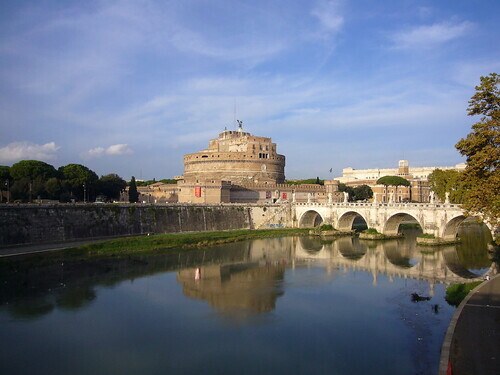 Tomorrow afternoon we leave for Rome and the Canonisation of Father Charles. The Scottish group is going from Wednesday to Wednesday as there is a direct flight on Wednesdays from Edinburgh. The Irish contingent (=the main pilgrimage) will arrive on Friday. Here is our Mass schedule for the week. 10.00 a.m.	Mass in the Church of Saint Alphonsus, Via Merulana (Shrine of Our Lady of Perpetual Succour). 11.00 a.m.	Mass in the Church of Our Lady of Graces, Nettuno (Shrine of Saint Maria Goretti). 8.30 a.m.	Mass with the Irish pilgrims at the Papal Altar in the Basilica of Saint Mary Major. 10.00 a.m.	Canonisation Mass in Saint Peter’s Square. 6.30 p.m.	Mass of Thanksgiving in the Passionist Basilica of Saints John and Paul. 11.00 a.m.	Mass at the Shrine of Saint Gabriel of Our Lady of Sorrows, Isola del Gran Sasso. 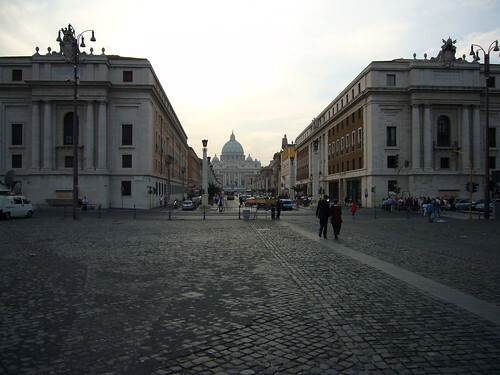 10.30 a.m.	Papal Audience in Saint Peter’s Square. Mass in the afternoon at an (as yet) unknown location. Yesterday, Pentecost Sunday, our community celebrated Father Hubert’s sixtieth anniversary of ordination. Father Marius had mentioned during the week that it was his fifty-fifth, and Father Eustace and Father Justinian will be celebrating their fiftieth in December, but a sixtieth of ordination is quite an achievement. Father Hubert decided that he would be able to be principal celebrant the 12.00 Mass. 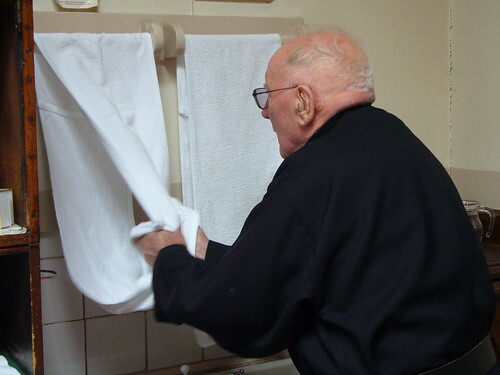 Now that his eyesight is almost completely gone, he hasn’t said Mass in the Church for a couple of years. Father Eustace assisted him with the parts of the Mass which were proper to the Feast of Pentecost; the rest of the Mass, including the Eucharistic Prayer, he knows by heart. 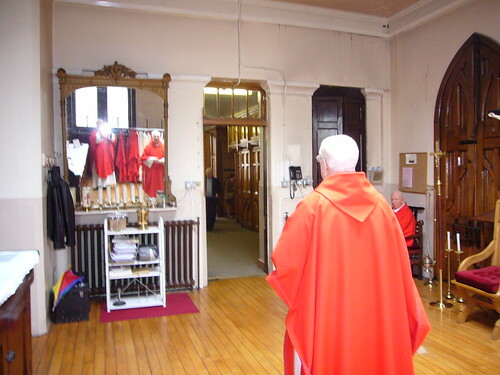 Here is Father Anthony (a mere forty-nine years ordained this year) vesting for the Mass while Father Marius looks on. You can see me in the mirror taking the picture. Father Hubert arrived in good time. Here he is washing his hands before vesting. And here he is heading for the vestments, wearing his new habit for the first time. It looks as if it doesn’t fit very well, but that’s only because he is wearing three sweaters in case he might feel cold in the church. Father Hubert invited me to give the homily which, I must confess, was more on his life and virtues than on the Feast of Pentecost. However, on his jubilee prayer card he had put the words of Blessed John XXIII: O Holy Spirit, Paraclete, perfect in us the work begun by Jesus. We celebrated Father Hubert’s jubilee a few days early because, although the actual date of his ordination is 31 May, he is leaving for Rome the day before to attend the Canonisation of Father Charles. -Not bad for an eighty-six year old! Sorry for the lack of posting in recent weeks. 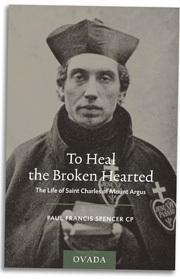 I’m very busy at the moment with preparations for the Canonisation of Father Charles of Mount Argus on 3 June. 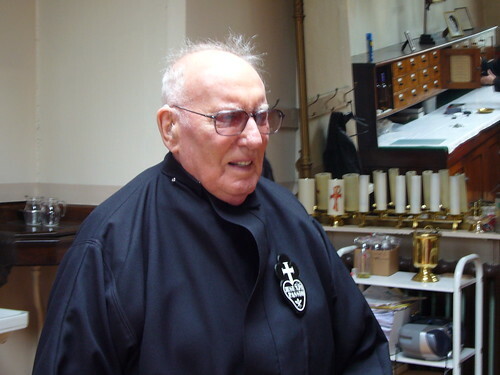 Meanwhile, Limburg’s T1 Television has made a short (eight minute) programme on Father Charles, starring both Father Harry Broers, parish priest of Munstergeleen, and our own Father Frank Keevins, rector of Mount Argus. The voice-over is in Dutch, but Father Frank and his parishioners can be heard in English. Here it is. Today, which was formerly the Feast of the Finding of the Holy Cross, is the foundation day for the Passionist Contemplative Nuns. I was reminded of this yesterday before leaving the Monastery of the Passionist Nuns at Erlanger, Kentucky (-not to be confused with their monastery at Whitesville, Kentucky, which I mentioned earlier). After three uneventful flights, I arrived home at Saint Mungo’s this afternoon, in time to vote in the Scottish elections.